Galveston, TX, USA — D3D Cinema and Moody Gardens have announced the grand opening of the MG3D Laser Theater at Moody Gardens, the first institution in the world to feature a giant screen 6-Primary (6P) laser projection system. Audiences will now experience films on a world-class 60 by 80-foot white screen – the largest in Texas – at nearly three and a half times brighter than the current industry standard, with vibrant colors and new 3D glasses technology. 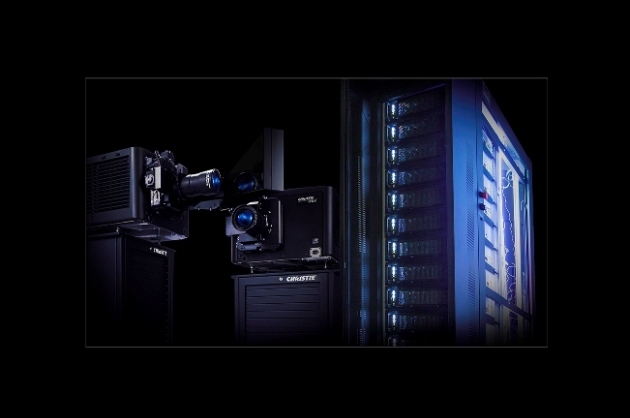 The 6P laser-illuminated 4K-resolution 3D dual projector system is manufactured by Christie, a world leader in advanced cinema technologies and visual displays. The 6P eyewear is designed and manufactured by Infitec GmbH. The 1.4 gain premium white screen was provided by MDI. Christie’s laser system provides unparalleled image quality using a pair of state-of-the-art 4K laser projection heads, a 6P modular laser light farm with fiber-optic delivery, and Christie 4K 3D high-bitrate IMBs. Infitec’s new 6P glasses deliver a startling 90 percent efficiency – unsurpassed in the industry. It’s the perfect complement to the 80 foot wide screen in the MG3D Theater, which is now capable of light levels over 16 foot-lamberts in 3D (measured through Infitec’s glasses). This is many times brighter than the theater’s previous 3D 70mm system and far exceeds any “ultra-bright” industry standards. This latest collaboration between D3D and Moody Gardens builds on a longstanding partnership. In January 2011, D3D and Moody co-hosted the first annual Digital Cinema Symposium, showcasing 4K projection technology on a giant screen for the first time, including the first 4K versus 70mm split screen shootout. The following year, at the 2012 Digital Cinema Symposium, D3D showcased the first 4K 3D, 11.1 3D audio, high frame rate demonstration as well as a prototype laser on a giant screen, all industry firsts. The 2012 event was a milestone, marking the first time that industry professionals overwhelmingly acknowledged that a digital presentation exceeded the quality of a 70mm film in a side-by-side comparison. A case study was recently published by D3D and Moody Gardens, illustrating the financial benefits and qualitative success of digital presentation and rebranding.